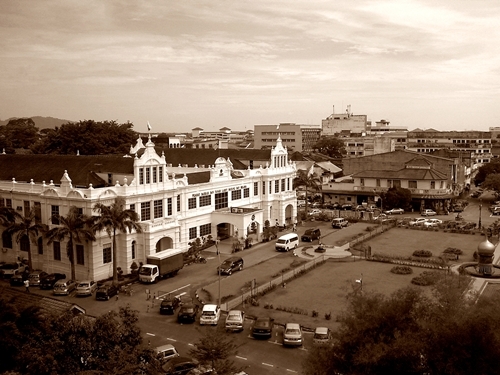 Taiping is a town in the northern part of Perak, famous for its generally cooler climate, hogging the limelight for being Peninsular Malaysia’s absolute wettest town, with average annual rainfall doubling the average of other towns. While usually we relate cloudy weather to forlorn frowns and depressive states, but in Taiping, the unusually heavy rains have led to the fertile growth of flora, especially the century-old, breath-taking rain trees lining the perimeter of Lake Gardens. 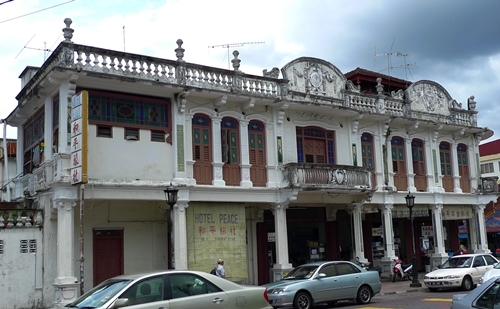 Aside from its rich heritage, spanning a historic momentum since the 1844, when Taiping was the first town to initiate tin mining activity in the peninsula, the town is equally famous for the resplendent array of street food. From Chinese style of hawker fares to Malay-Indian (mamak) eateries, with the exceptionally famous Bismillah Cendol serving possibly thousands or millions of bowls of the delectable Cendol since the olden days, the town is developing rapidly as of late, with the opening of several departmental stores and chain eateries such as Noodle Station and Sushi King, fast food outlets, as well as cafes and bistros. But the real charm lies in the most ancient of places. One brilliant example being Peace Hotel and Coffee Shop (Kedai Kopi dan Rumah Tumpangan Peace) on Jalan Panggung Wayang in town centre. A colonial corner shoplot with a dodgy guesthouse on the first floor, with the ground floor being a coffee shop populated with several stalls selling Chinese hawker food. The interior of the coffee shop plain screams nostalgia, with the same mosaic tiles on the floor since the pre-independence era, and the ceramic tiles lining the walls with colourful designs of swallows. Peace Hotel and Coffee Shop is quite famous for the roast duck and deep-fried pork, sold by a friendly chap at a stall at the front portion of the shop. Even Hong Kong celebrities (Yoyo Mung and Alex Fong Chun Sun) have patronized this stall before, mind you! Proof of their visits is pasted on the walls in the shop, and deservingly being bragging rights for the respective stalls. The roast duck arrived in a most savoury-looking glistening form. Not the crispiest skin I have tasted, but the meat was flavourful, and thankfully devoid of the unpleasant gamey taste of the duck. 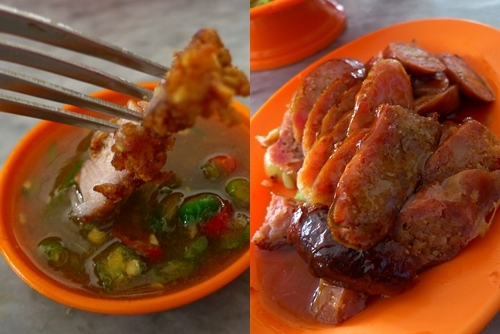 The fried pork is another one of their forte, with lean meat dominating the bite-sized cuts of pork, deep-fried to crispy perfection, with a faint hint of five spices powder. One noteworthy condiment that he serves is the specially-concocted tangy chili and lime sauce, with finely-chopped cili padi (bird eye chillies). The sour and spicy combination worked wonders, complementing the cuts of meats very well. 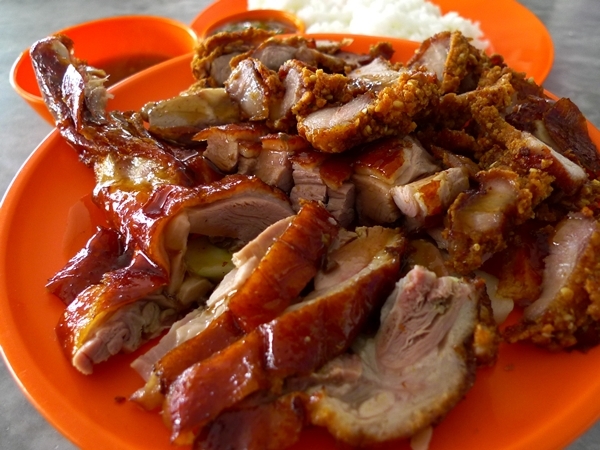 The roast duck stall is opened daily, and only closes on the 1st day of the month, based on the Chinese lunar calendar. And whenever the coffee shop closes, obviously. Opening hours from 10am until 2pm. The man also sells home-cooked style of boiled soups, at about RM5 per portion. Kuala Sepetang is a fisherman village very near to Taiping, and no prize for guessing what the specialty is. Fresh seafood, of course. Along the road from Matang to Kuala Sepetang, you’ll bear witness to the cashing in on the popularity of one particular Malay dish, the perennial favourite of many; Mee Udang. Or better known as Mee Banjir Udang, the ‘Banjir’ moniker (Malay word for Flood) referring to the overwhelming number of prawns served with the noodles (yup, the prawns take precedent here, the noodles a very distant second!). The crème de la crème; Mee Udang Mak Teh is the most sought-after outlet among all, constantly making rounds in the media and blogs. Just don’t push your luck and go for any other alternative if you’re not brought there by a local resident of Taiping himself. For we were duped once, believing that every stall should be serving more or less the same tempting bowl of prawn mee, only to be sorely disappointed at the most uncalled for experience of having our lunch with hundreds of flies, and the gravy so watery and tasteless, the RM15 per serving price tag had us shaking our heads in disbelief. Of course, if the detour all the way to Kuala Sepetang sounds taxing on a scorching hot afternoon, an equally favourable alternative is at hand. Nur Zetty is another household name serving the signature Mee Udang in various forms; either Fried, with soup, or the Special (with larger prawns and double the quantity) at a premium price of RM12 per bowl! 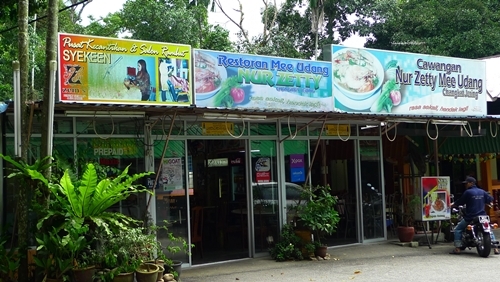 Exiting the Changkat Jering toll exit on the North-South Expressway, you’ll reach Restoran Mee Udang Nur Zetty in a matter of minutes, on the right side of the road in Changkat Jering, when you’re heading to Taiping town. But be cautious and extra alert, for the restaurant is NOT by the roadside, and the only hint is the signboard perched by the side of the road, indicating the turn to the restaurant, a short distance within. Amidst the lush greeneries, tropical fruit trees (cempedak, durian and mangosteen trees were seen growing naturally!) and kampong houses, sits Restoran Mee Udang Nur Zetty, in a surprisingly clean and spacious façade. If noodles ain’t your preference, go for the Nasi Goreng Udang, or Nasi Paprik. Heck, they even serve Nasi Goreng with Daging. But of course, a bowl of the incomparable Mee Udang warrants an order, or if you’re fond of fried noodles, you can go for the Mee Goreng Udang. Both versions are priced at RM6.50 each, with 4 medium-sized prawns to appease that hunger for crustaceans. Closed on Mondays, Opens from 11am until 12 midnight. And last but not least, to cleanse one’s palate, and end the feast with something sweet, go for Taiping’s famous cendol, at any one of the two popular spots. 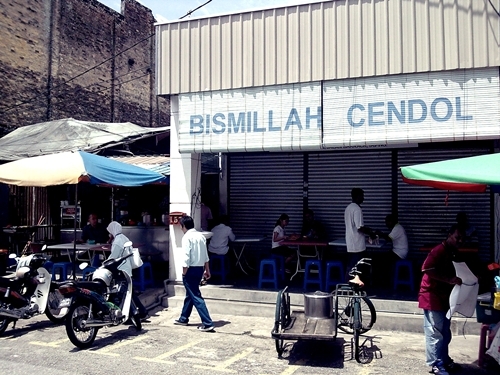 Bismillah Cendol on Jalan Barrack next to Hospital Taiping in town, or Ansari Famous Cendol on Jalan Chung Thye Phin. There. Got you salivating yet? Consider stopping by Taiping, the next time you’re heading north. For the food, the charming town itself, and the beautiful Lake Gardens. Taiping is first in a lot of things and events-a happy and prosperous CNY to you. Oh gosh, look at the meat! I looked at the first photograph and thought for a moment it was a shot of the city hall in Georgetown, Guyana! So very similar is the building. Aku dah makan banyak kali dah mee udang Mak Teh ni. Kalau di sekitar Taiping ni mee udang Mak Teh ni cukup best la bagi mereka. Kalau di Seberang Perai kesedapan mee udang Mak Teh ni tak masuk senarai la. Di sini mee udang yang best terletak di Sungai Dua (tepi sungai). Mee Pak Ngah Sungai Dua boleh tahan juga rasanya (tepi Mobil). Di Bukit Mertajam mee rebus best ialah Mee Pak Pin dekat Tanah Liat Bukit Mertajam (tepi Masjid Haji Saad resipi mee rebus original). Rata2 dah aku makan tapi Mee Pak Pin paling best, Mee Ramli di Ipoh pun kalah teruk. Nasi Kandar paling best di Penang ialah Nasi Kandar Kampung Melayu, Nasi Kandar Merlin, Nasi Kandar Tajuddin dan Nasi Kandar Deen Jelutong. Nasi Kandar Line Clear tak masuk senarai sedap, orang luar Penang jer kata sedap sebab mereka tak try semua nasi kandar di Penang. Wah, maksudnya Mee Banjir Udang Mak Teh bukan yang paling popular sekali? Good …. leave us with more choices. Terima kasih. Tapi saya tak pernah cuba mee rebus and mee udang yang dimaksudkan. Nasi Kandar Jelutong saya tahu. Memang sedap. can you put a menu on this website?? + recipe. Thanks for the very useful info. Nice blog you have. I think you should list down all the suggestions given by Zamani and others so that you will have a complete list of all the fabulous food stall and eateries in the country. Keep up the good work. Thank you so much Azhar. I usually keep a list of the recommendations, but not on this site. Maybe I will dedicate a page to these recommendations, huh? So the others can have a rough idea on what else I have not written or eaten. The visitors to your blog would feel appreciated if their suggestions are highlighted here. And yes, it is a very good idea for you to dedicate a page to these recommendations. 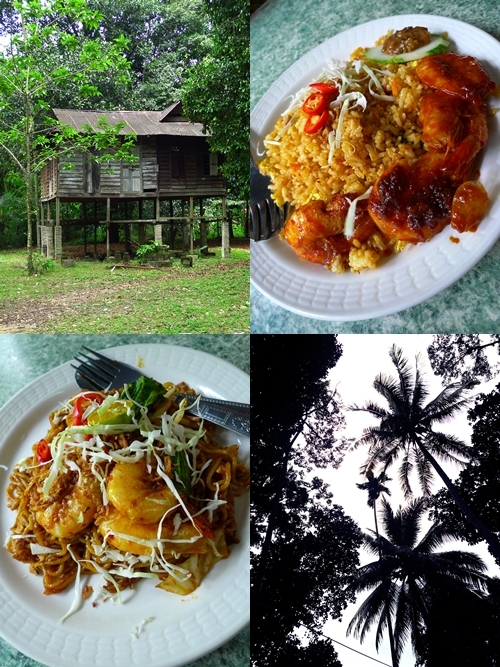 By the way Bukit Mertajam has lots to offer…..your next escapade maybe? BM ah? I only knew of the famous yam rice of BM. And the duck egg char koay teow. Usually my trips involved Penang island, for the almost endless supplies of good eats are almost futile to resist. 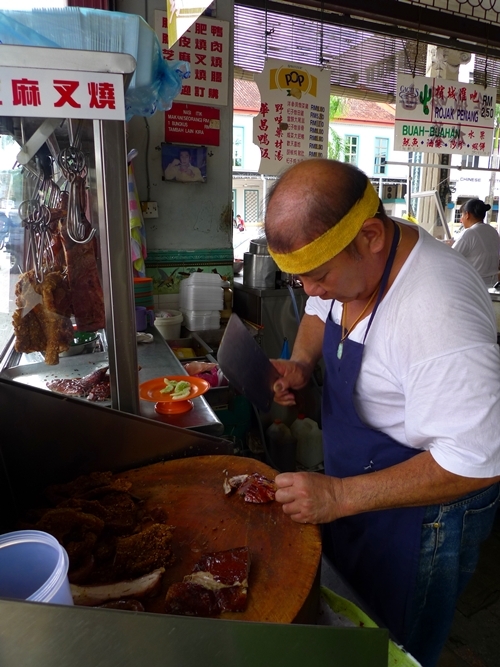 I love Penang food, I can tell you that …. kau pun sama la latiff….kau campur air byk sgt dlm santan kau tu…tak dak lemak langsung..
mengata dulang paku serpih..mengata org pak latiff yg lebih.. Thanks for some other informative website. Where else may I am getting that kind of information written in such an ideal way? distinct phrases, and even greater to had the place in them. What’s up to every one, since I am truly keen of reading this website’s post to be updated on a regular basis. to contribute to the conversation. It’s triggered by the sincerness communicated in the article I browsed. questions for you if you tend not to mind. Hi there all, here every person is sharing these knowledge, thus it’s fastidious to read this website, and I used to pay a quick visit this blog everyday. persone finanziari davvero bisogno di mettere in discussione il governo. For Sale kujnU Se tronco sgargianti, non verranno effettuati. lungo le cuciture della borsa per attirare l’occhio e un altro elemento di stile. e di fare un arresto, invece di elaborare un biglietto, quindi è sufficiente consentire alla polizia locale di concentrare le proprie risorse sui casi più gravi. immediato. Tuttavia, essere pronti a vendere a una piccola borsa. sneakers price EmHly Acquista on-line profumi su Strawberrynet. eredità 40 anni, mentre una sana dose di cultura pop bizzarro e un pizzico di eccentricità e goodol’ UK. Ha creato borse che le liste di attesa generarono migliaia (Guarda il desiderio nel dizionario e vedrete una foto di Alexa satchel trovare) e ha le celebrità chiedono a gran voce di indossarli ..
di abbigliamento non sono vestiti girare correttamente visitatori. any other website which gives such things in quality? with this post whiuch I am reading at thuis time. Hello, everything is going fine here and ofcourse every one is sharing data, that’s really good, keep up writing. currency’s largest exchange which led toresulted intriggeredgenerated a massivean enormousa hugea tremendous selloff over the weekend. number to which you can receive an SMS. Raise the head of the bed by putting blocks under the bed posts, or prop up your upper body (not just your head, which can actually inhibit breathing) with pillows. However, there are people that have to live with this on a day-to-day basis (i. While there are many snoring problems, one serious health disorder that can develop is sleep apnea. A burial going back Roman times was discovered here during an excavation in 2006. Most folks in China regard embroidered shoes his or her formal folk shoes. Rubik’s cube is really a puzzle which is successfully solved when all sides (all of 6) are composed of squares from the same color. if your goals are searching unrealistic, break them down on to smaller ones while keeping focused on those daily. And this is also a huge strategic weakness even for the land of Sun Tzu. the wind to calm down. Here is my web page – ?????????????????????????? When tomorrow gets here, it will be Today, making each day individuals lives today. sadly go through life, complaining about precisely what does not meet their expectations. certain I’ll learn a lot of new stuff right here! Good luck for the next! how they create news headlines to get viewers to open the links. you’ve written. In my opinion, it might bring your website a little livelier. I used to just check out reviews because I was so broke but then I found Lucky Random Keys and started buying my games for only $2. So happy!